General rule: Inject into chamber or vessel proximal to area of interest. (iv) Note: Wash-out from A-P collateral flow into branch PA may interfere with 3D reconstruction. (ii) Total volume of injection: 1.5 ml/kg (Divided for simultaneous SVC/IVC injections. Usually, 50/50. But, this may vary based on flow characteristics of SVC/IVC flow into each branch PAs). (iii) Note: Wash-out from A-P collateral flow into branch PA may interfere with 3D reconstruction. (ii) Total volume of injection: Varies depending upon vein size, degree of stenosis, collateralization, etc. (iii) Inject as PA wedge angiogram. Begin injection, but wait until contrast appears in pulmonary veins before initation of rotation. (ii) Total volume of injection: Inject enough to opacify vessel during the entire acquisition. Amount varies based on vessel size, stenosis, etc. (ii) Total volume of contrast: Enough to opacify the vessels during the entire acquisition. Amount varies depending on anatomy. (Adapted from Denver Children's Hospital Protocol. Courtesy: Dr. Tom Fagan). 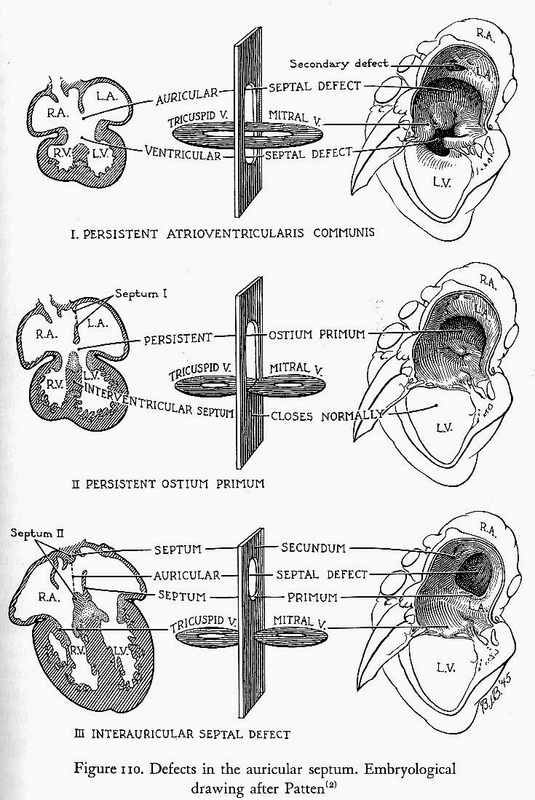 From "Congenital Malformations of the Heart" by Helen B. Taussig. Harvard Univ. Press, Cambridge, MA 1947. Page 355.